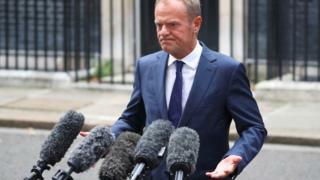 European Council president Donald Tusk has said not enough progress has been made to move to the next phase of Brexit talks in Brussels. He said Theresa May’s “realistic” speech on Friday showed the UK’s “philosophy of having a cake and eating it is finally coming to an end”. But he said “there is not sufficient progress yet”. Mrs May had hoped her offer of a two-year transition period after Brexit would unblock talks in Brussels. Emerging from Downing Street after talks with Mrs May, Mr Tusk said: “I feel cautiously optimistic about the constructive and more realistic tone in the prime minister’s speech in Florence and of our discussion today. “This shows that the philosophy of having a cake and eating it, is finally at an end. At least I hope so. That’s good news. “But of course no-one will ever tell me that Brexit is a good thing because as I have always said, in fact, Brexit is only about damage control. “And I didn’t change my opinion. I feel now we will discuss our future relations with the UK once there is so-called sufficient progress. 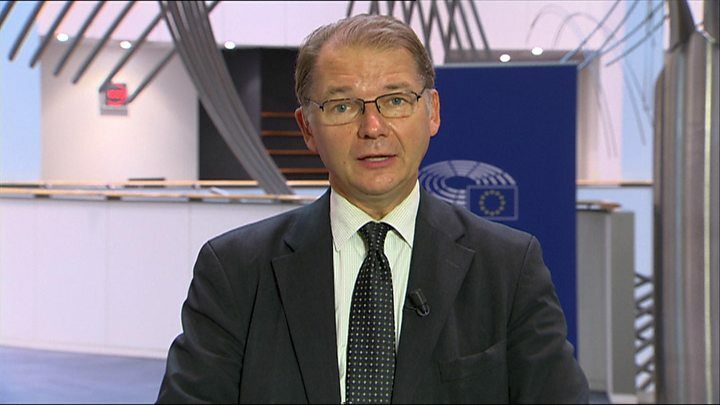 His words come a month before the European Council will decide whether sufficient progress has been made to begin trade talks, as the UK wants. Hesitant, understated, but with a very clear message. In fact, so quietly spoken those of us listening here, crouched beneath the cameras, a metre from his shoes, could barely hear his words. Two pieces of imagery have been frequently leaned on in updates on the Brexit negotiations. The EU has a love of noisy timepieces; all those references to ticking clocks. And the desire of some in the UK to have our cake and eat it crops up quite a bit too. Mr Tusk’s “hope” that the references to gorging on confectionery are over stood out. But so too did his blunt assessment that more has to be achieved before the talks move on to the future relationship. So, for the prime minister, did her Florence speech do the business? From her perspective, it looks like it has worked a bit, but not yet enough. The council says it first wants more detail on citizen’s rights, a financial settlement and the Irish border before turning to the kind of trade deal the UK will have with the EU after it leaves. Brexit Secretary David Davis, who is taking part in the fourth round of Brexit talks in Brussels, said that Mrs May had shown “leadership and flexibility” in her Florence speech and given reassurances on financial issues. 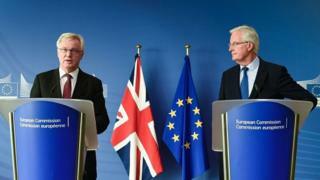 But the EU’s Brexit negotiator Michel Barnier called for a “moment of clarity” from the UK. 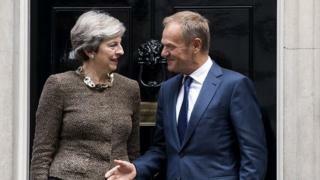 Speaking ahead of her meeting with Mr Tusk, Mrs May said that “by being creative” the UK and the EU can maintain cooperation and partnership when the UK leaves the EU. And she said that “things have moved on” in terms of the discussions and negotiations in the Brexit talks.